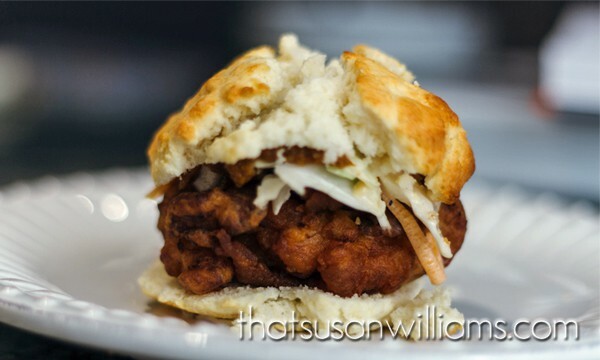 Mimosa Fried Chicken Biscuit with Sweet Potato Butter and Sriracha Slaw. Mimosa Fried Chicken Biscuits with Sriracha Slaw an Sweet Potato Butter are the perfect meal to serve during a football game, perhaps with a glass of your favorite Highland Brewing Beer. 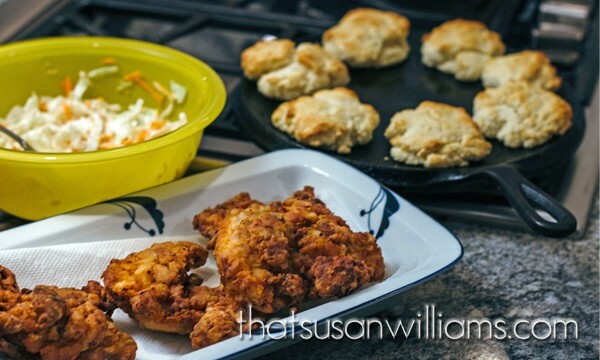 There is a story behind this recipe for Mimosa Fried Chicken Biscuits, and it all started on my recent trip to Foodtopia – also known as Asheville, NC – when I went there for the Food Blog Forum. 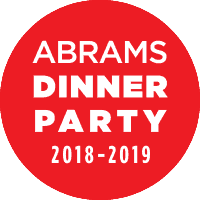 On Tuesday, following the conclusion of the actual Food Blog Forum conference events themselves, the city of Asheville was not done with us, her lucky guests! Oh, no! Not by a delicious long shot! Foodtopia, the Tour, was only just beginning! 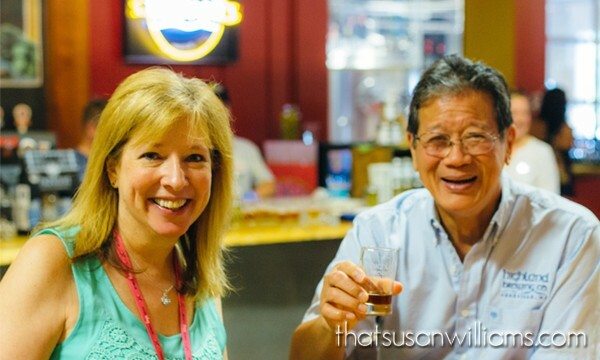 We were taken by bus to the Highland Brewing Company, where we were met and welcomed by the incomparable Oscar Wong. I don’t throw that term “incomparable” around lightly, either. What a remarkable guy! He introduced himself saying that he was the son of Chinese parents, born in Jamaica, who went to school at Notre Dame (where he got a little Irish in him), moved to California, became a successful engineer, worked on nuclear power plants, and has been married for 49 years to a woman who still likes him. “My house and car are paid for, I’m doing what I love, and I’m basically living the American Dream.” (How can you not like a guy like that???) Oscar started the local brewing scene 20 years ago, after he retired, as a hobby. Some retirement!!! And in so doing, he was laying the foundation for many other local artisan breweries. 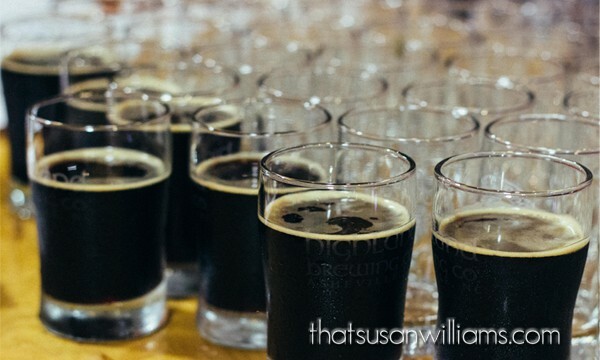 So many, in fact, that Asheville has become known as Beer City, USA. (This title is hotly contested by Portland, OR, in an east vs. west tug-of-war.) He is known around Asheville as the Godfather of Brewing. 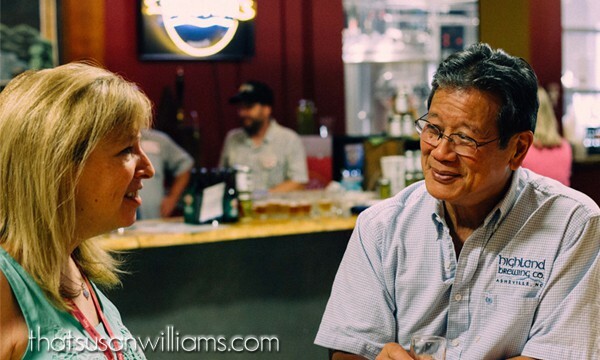 Me, chatting with Oscar Wong, owner of Highland Brewing Company. Where Oscar and I really connected was in talking about our respective daughters. Proud parents love to swap stories, and I could tell you a story or two about Oscar’s beautiful daughter Leah, who is so very competently following in her Dad’s footsteps, and is set to take over entirely running the company. I’ll keep those stories to myself, but I will say that I have no doubt whatsoever that Leah has everything it takes, and more, to take the helm of Highland Brewing Company. Cheers! Here’s to visiting Asheville, again, and again. 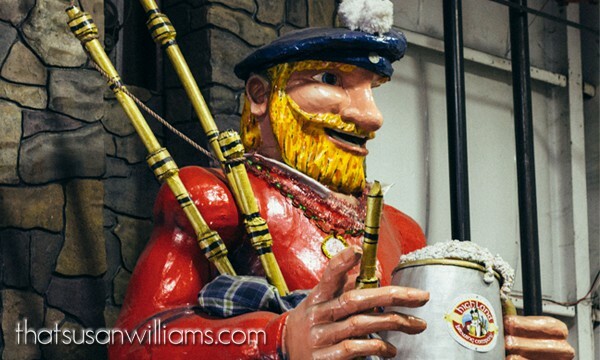 Highland Brewing Company’s Highlander, who might be a wee bit high. 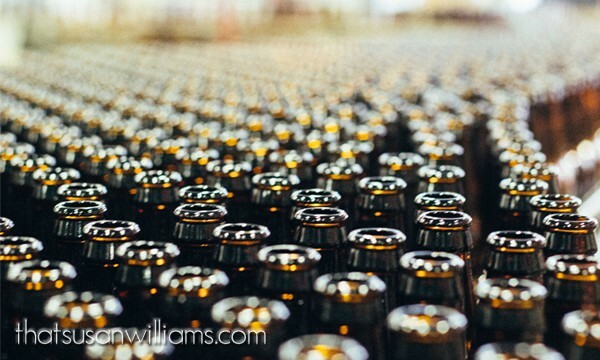 Gratuitous beer bottle artsy shot. 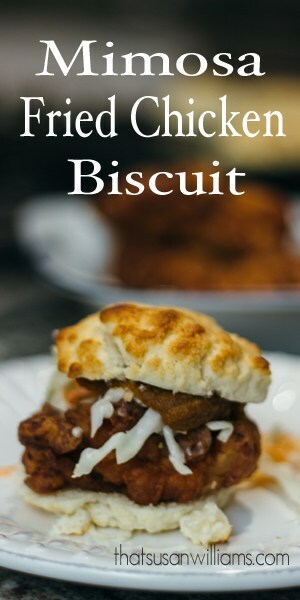 Highland hosted a restaurant tasting event (the one I mentioned in my last post, where I tasted the marvelous honey that came from the The Asheville Bee Charmer, and my husband’s favorite bite, hands down, came from a restaurant called Biscuit Head. It was their Mimosa Fried Chicken Biscuit. He kept saying, “That chicken was ROCKIN’!” When I got home, for my husband’s sake, I knew I wanted to attempt to recreate it. Imagine my delight when I found the recipe on the flash drive that Asheville sent home with me. 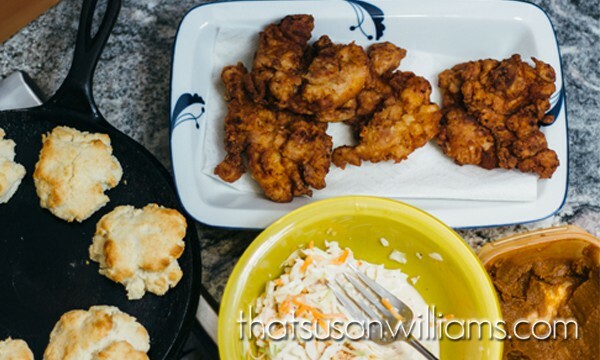 We’re getting ready to have a biscuit and fried chicken party! 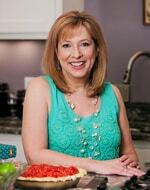 So that you can learn from my mistakes, I’ll share with you what I’ve learned from making this recipe several times. First, I do NOT recommend that you try this with chicken breasts. I did, and the thighs do a MUCH better job of soaking up the flavor of the orange juice and spices. So go with boneless, skinless chicken thighs, which make a much better biscuit sandwich. 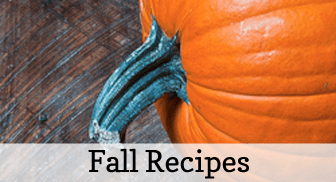 I’ve included in the notes section of the recipe all the alterations I made to the recipe- and there were a few – to adapt it to my family’s taste. (I’d go so far as to say they’re improvements, but that’s just my opinion.) 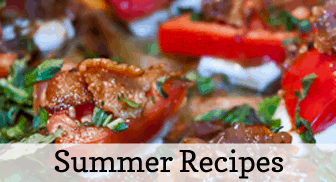 My best advice is to start this recipe the day before you want to serve it. Get the chicken in the marinade, make the dressing for the slaw, and the sweet potato butter. Each of these tasks is quite easy, and can be done fairly quickly, leaving not that much to do on the following day. I think Mimosa Fried Chicken Biscuits would be PERFECT for a football game party in your own living room, served with your favorite brew. And I know Oscar would love it if you’d give one of his Highland Brews a try! 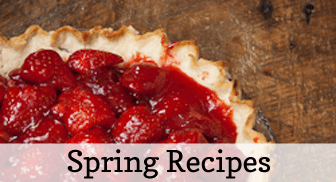 Please, pin this post on Pinterest, so that you don’t lose the recipe. Or share it with your friends on Facebook. Or tweet it on Twitter, if that’s your thing. In the lower right corner, you can see the container of sweet potato butter, that literally helps hold the sandwich together, and adds such a lovely sweet note! The chicken soaks up the flavor of the spices in the marinade, the sweet potato butter adds a sweet note, and the sriracha slaw brings heat and fresh crunch. Mix all of the chicken marinade ingredients together and marinate overnight in a ziplock bag. Mix all of the slaw dressing ingredients together EXCEPT the cabbage/cole slaw mix. Allow the ingredients to "marry" in the fridge overnight. When ready to assemble the sandwiches, stir dressing onto cabbage/cole slaw mix, and mix thoroughly. Boil sweet potato till fork tender. (Mine took about 15 minutes, but you'll need to test yours with a fork.) Drain all water from potato and mash with sugar and spices, and zest. Store in plastic container overnight, until ready to assemble the sandwich. Shake the chicken around in a bag with some flour. (I use an old, clean brown paper bag.) Let the chicken rest for a minute or two, to be sure the flour adheres. Fry it in oil in a cast iron skillet, if you have one. (I use canola oil usually, although if I'm lucky enough to have peanut oil around, it's my first choice for frying.) 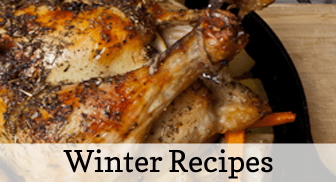 Oil needs to be around 350-375º, and the chicken needs to cook to a temperature of 165º. To assemble the sandwich, I spread sweet potato butter on the inside of the top half of the biscuit. It will help secure the cole slaw. Put the chicken thigh on the bottom half, some slaw on top of that, and then, the sweet potato butter "top hat" goes on top. THE DAY BEFORE YOU PLAN TO SERVE: Marinate the chicken, make the dressing, and make the sweet potato butter. Each component is very easy and quick to make. THE DAY YOU PLAN TO SERVE: All that will remain to be done is frying the chicken, making the biscuits, putting the dressing on the cabbage, and assembling the sandwich. The original recipe varied slightly. I made some changes the second time I tried this recipe, which seemed to improve the flavor, to me. Here are the changes I have made: I have doubled the curry powder, changed the "paprika" to smoked paprika, omitted any water from the brine (the original recipe called for two cups of water, but using OJ alone worked fine, since I was going for greater intensity of flavor in the chicken). In the slaw, I have used less pepper and sriracha, because I think too much heat numbs the taste buds. In the sweet potato butter, I have added lemon zest and a little salt, because the sweet potato butter I made according to the original recipe was a little too sweet, and a bit flat in flavor. Or, you can use your own favorite biscuit recipe.